We are in the midst of a correction but more importantly, major markets have broken their uptrend line from the bear market lows. But that doesn’t mean that the bulls have totally lost control. Instead, I think the momentum thrust that was pushing the market higher has ebbed. 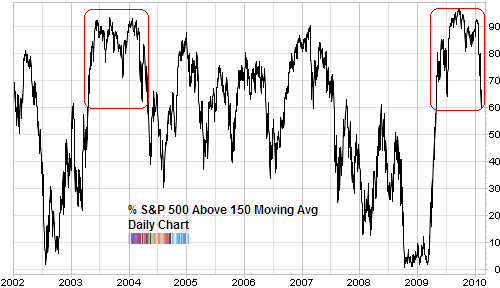 Going on 9 months (since May 2009) this indicator of breadth has been higher than 60%. 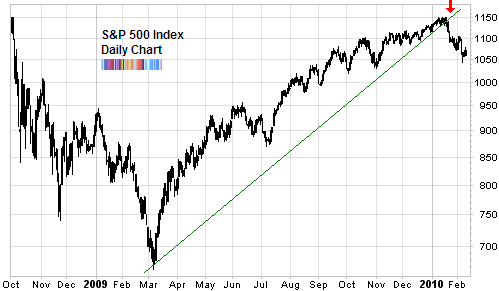 This means that the majority of the S&P 500 components are trading above their long term trend. Which in turn means that there is little resistance for the bulls to fight against as they propel prices higher. The last time we saw a similar momentum thrust was in 2003 as that cyclical bull market started in March 2003. 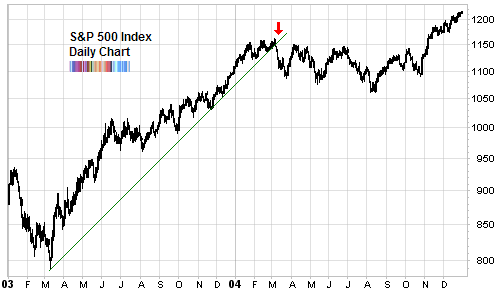 We’ve been comparing this market to the last bull cycle for a while now and for good reason. At each turn it seems to offer us yet another similarity. As they say, history doesn’t repeat, but it does rhyme. By the way, while we looked at the major markets around the world which are almost all consistently telling us of a major breakdown in trend, the semiconductor sector (SOX) which has powered the US markets higher continues above its trend line. What do you think? Will history repeat again? I think the one difference between now and the 2003-2004 picture is the different fundamental backdrop. In 2003 and 2004 we had this massive money machine in the form of the US housing bubble which was injecting so much money into the American economy. And all that money circulated through the US economy. Also, all the derivatives were being created at the time. Do we have something now as big as the US housing bubble to fuel the economy forward? Is the China stimulus big enough? Agree with Samuel. To with, IIRC the total value of the US economy is something like 14.4trn, the EU is something like 13.8trn. China? 4.4trn. It’s naieve to think China can pull the US and EU out of their problems — they need to sort themselves out.